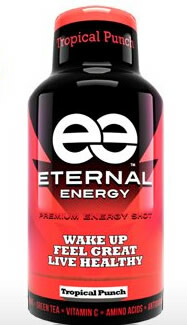 Eternal Energy Shot is a highly caffeinated energy shot available exclusively at Walmart stores. The shot comes in four flavors, all with the same energy blend. The caffeine in Eternal Energy Shot is derived from caffeine anhydrous, green tea, guarana, and yerba mate. The shot also delivers amino acids, vitamins, and antioxidants in addition to the caffeine. Walmart's Eternal Shot is sugar-free and sweetened with Sucralose and Ace K.
Walmart sells Eternal Energy Shot for just 88 cents, which is much cheaper than competitor 5 Hour Energy. RECOMMENDED USE: For maximum effectiveness, consume one bottle daily. Do not exceed two bottles daily, consuming each bottle several hours apart. Discard open bottles within 72 hours. How Does Eternal Energy Shot Compare? Eternal Energy Shot contains 115.03 mgs of caffeine per fluid ounce (388.95mg/100 ml).